Agri-Services and tell you a little bit about ourselves. We're Jim and Sue Guarino, owners and founders of the business. 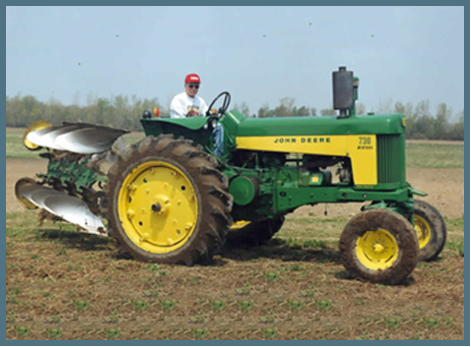 Jim, an agricultural engineer by trade, has been doing farm service and custom farm field work since 1971. We own and operate a small hay and grain farm and are members of the Western New York 2 Cylinder Club. A few years ago, our neighbor needed a John Deere™ D rewired, and we needed some round baling done. A trade was made, and since then, we have been providing restoring wiring harnesses throughout the United States, Canada, and abroad. The restoration of vintage tractors has grown tremendously in the last few years. Restorers spend a lot of time and money to bring a tired piece of farm machinery back to life. But when it's done, you can step back and picture it being brought home from the dealer for the first time! Some of our customers even remember that day back when they were little. Tractors are being passed down from generation to generation. So if you should be passing by something that looks like a pile of rust in the weeds, check it out! It might be something you can pass down someday.